150 Media Stream is a multi-faceted achievement in art, architecture and technology that celebrates the transformational power of art as collective experience and explores the interplay of art, space and viewership in both public and private contexts. During regularly scheduled “artists’ moments,” residents and visitors come together to experience media art displayed at a grand scale, as 89 LED blades stretching 150 feet long and rising 22 feet high ignite into light, color, and movement. Developed in partnership with Chicago’s premier arts, culture and higher learning institutions and private supporters, the 150 Media Stream is an international platform for both rising and established Chicago, US and global media artists. The installation also features competitively selected collaborative works by exceptional art educators and students through its groundbreaking media arts program, ensuring a truly representative cross-section of Chicago’s diverse arts community. Located at 150 North Riverside Plaza in Chicago, the 150 Media Stream is the only structure of its kind dedicated to showcasing Chicago artists, culture and history alongside renowned and emerging artists from around the world. Riverside Investment & Development's most recent venture, 150 North Riverside, is located at the confluence of the three branches of the Chicago River and is a bold expression of the firm’s innovative vision and commitment to excellence. 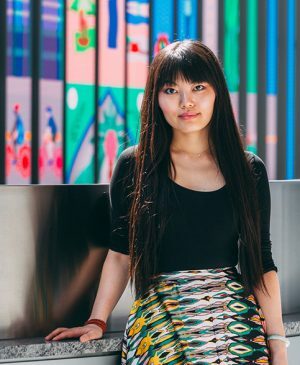 Yuge Zhou is a Chinese born, Chicago-based artist whose video and installation works explore urban environments as they are inhabited with the collective rhythms and patterns of human activities. Zhou earned her Master of Fine Arts from the School of the Art Institute of Chicago. She also holds a Master’s degree in Computer Engineering from Syracuse University. Zhou has exhibited her work nationally and internationally including the Grand Rapids Art Museum; Elmhurst Art Museum; Spartanburg Art Museum; Chicago Cultural Center; among many others. Zhou's work has also been featured in the New York Magazine; The Huffington Post and Aesthetica Magazine.